Nothing much going on here. I thought I would entertain you with a couple of pictures so you can get another Laika fix! Notice all of the tufts of stuffing? This is about the 4th toy that we've had forever that she's destroyed. At least she was staying busy and didn't tear up anything she wasn't suppose to! How could anyone deny this face? I'm trying hard to keep her off of the couch, but she keeps trying! I'm holding my ground, though! This is a dish that one of the teachers made for our "TLC" (Tuesday Lunch Club) at school. Very good, very light. A perfect light dinner for those days when it's too hot to turn on the oven! Tear spinach into bite size pieces. Toast pine nuts at 350 degrees for 5 minutes, do not burn. Combine all ingredients and shake well to blend. Pour over the pasta and spinach mixture and toss well. CH & MS liked it; OS said he wasn't real crazy about it, and YS didn't have any because he had just had his wisdom teeth cut out. I made the salad ahead of time and left out the spinach so it wouldn't wilt once I put the dressing on it. Also, that way everybody could put however much spinach in it that they wanted. I cheated a little and used the Perdue Grilled Chicken Southwestern Style (in the blue box). If you try it and modify it, let me know so I can try it, too! That pasta salad looks and sounds YUMMY! With 100+ degree weather ahead of us, I believe I'm definitely going to have to try that! And thanks for sharing more Laika pictures. She's adorable. You are much stronger than us - our dogs are always on the couch...and Kali gets annoyed if you sit in the recliner too long, that's *her* spot - ha! That pasta salad looks supper yummy! Sounds yummy! I make this kind of dinner all the time. We're pasta freaks anyway, but being able to get FRESH makes all the difference! 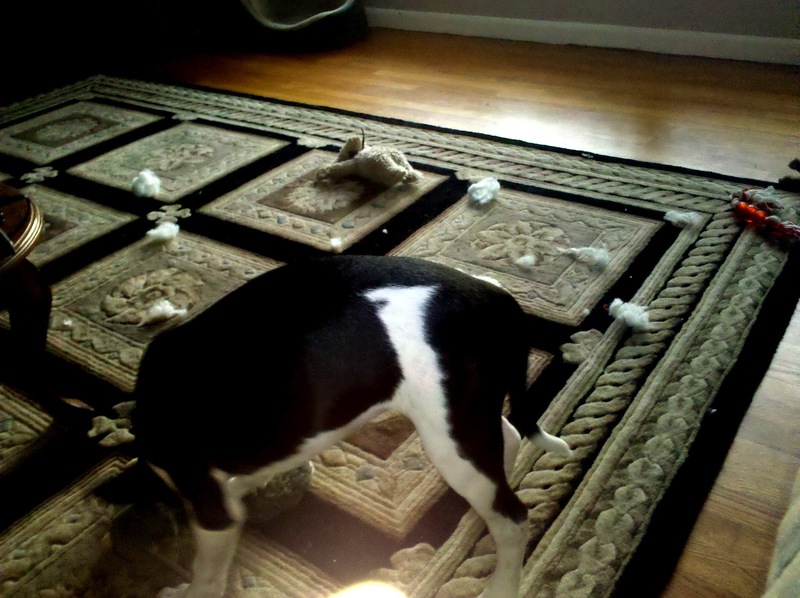 At least she didn't tear up the rug! Our dog isn't allowed on the couch either. I was away this weekend and hubs texted me a picture of our pup on the couch with him. I'm viewing it as a special treat and not a habit in the making! Looks like a good recipe! I'm going to have to try it! You're like the rest of us, the dog is getting you trained. LOL They turn on those big puppy eyes and it's awfully difficult to tell them "no". Dogs on the couch...hold your ground. That's all I'm saying. Our little Skye is the first dog we have had that is distructive to all her toys. Aww.... yes you can't deny that sweet face! The Grilled Chicken Pasta Salad looks yummy.